I hope everyone is having a wonderful holiday! Eating tons of good food, sipping plenty of eggnog, and spending quality time with loved ones! One of the things I was really hoping to happen this holiday was to travel to somewhere with snow and have a White Christmas. Sadly, by the time I found out we had a full week off of work and started looking into going somewhere, everything was booked. I am a little bummed, actually, quite bummed. But at least the weather here in the San Francisco Bay Area has been cold and I am able to bundle up in some of my favorite outerwear, like this shaggy coat I am wearing. 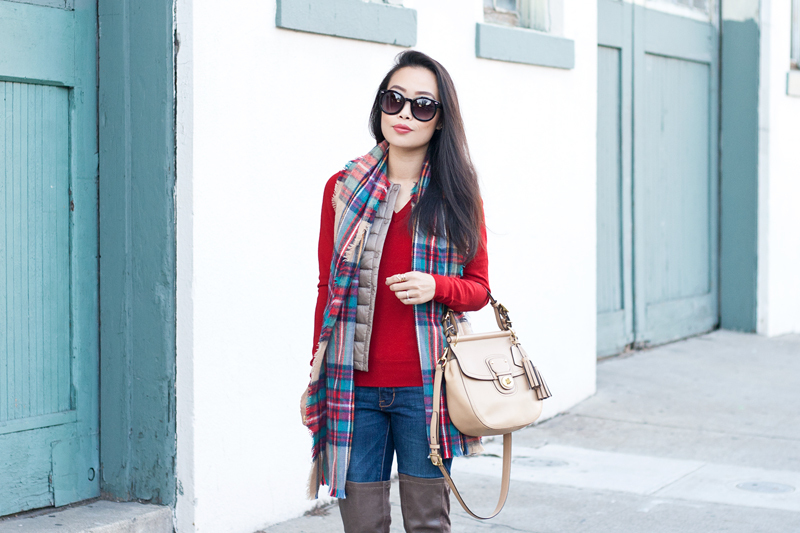 I paired it with a very holiday-esque plaid shirt, these amazing moto jeggings, and a navy handbag. Funny story... when my fiancé saw my coat, he said to me "That looks like Jon Snow." Ok, I'll take that as a compliment. 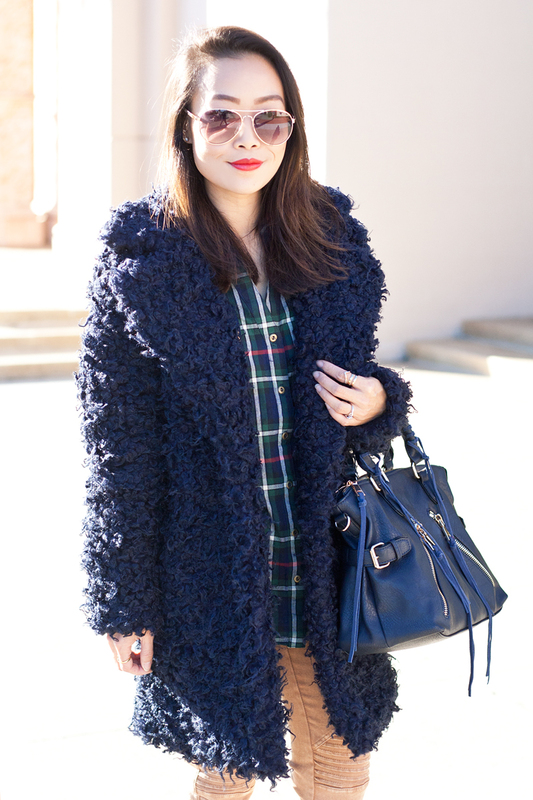 Navy shaggy coat c/o VICI. Moto jeggings in camel c/o VICI. 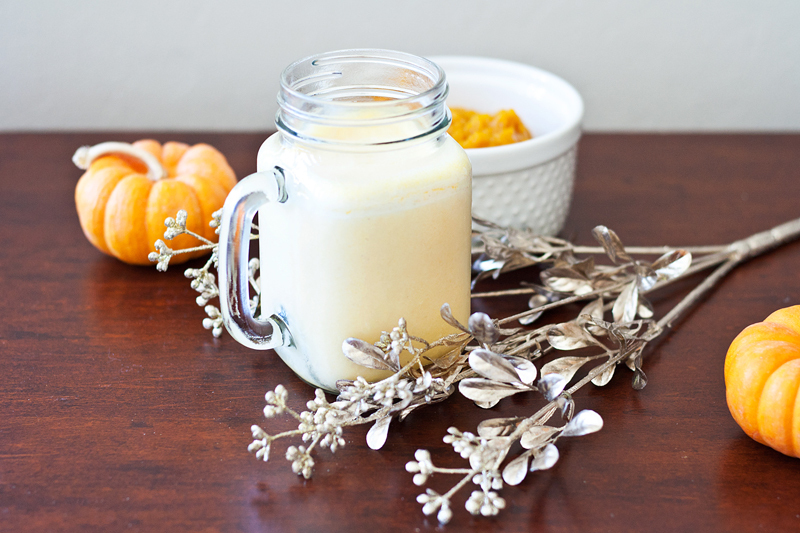 Move over, pumpkin spice latte! 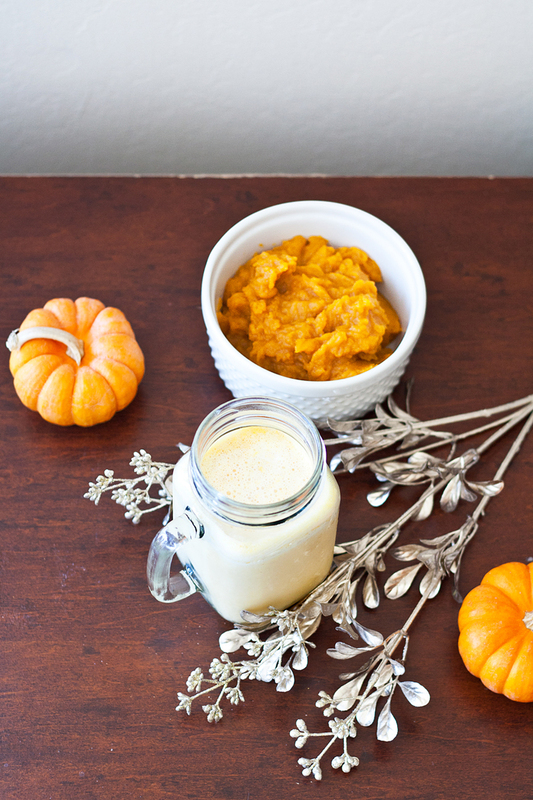 It's all about the pumpkin vanilla shake! Do you ever feel wasteful when you only need a tiny bit of an ingredient to make something and don't have any use for the rest? 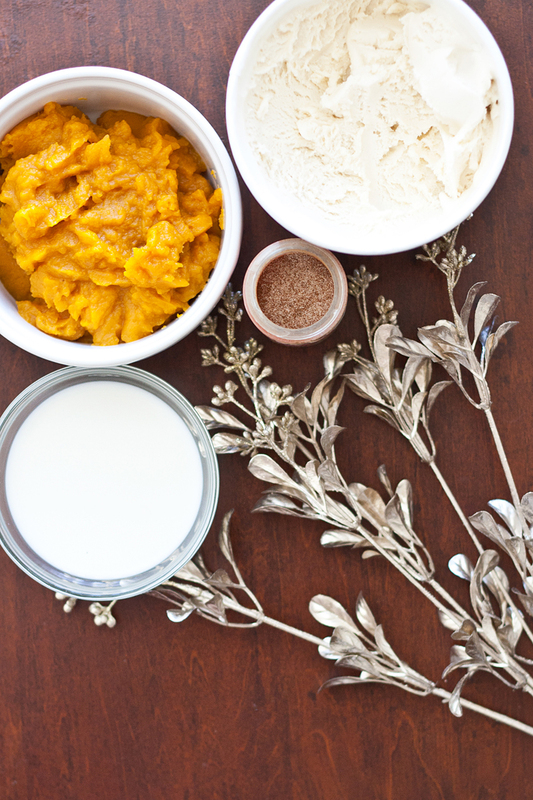 Well, if you have any leftover pumpkin from your pumpkin pie baking this holiday season, then you are in luck! 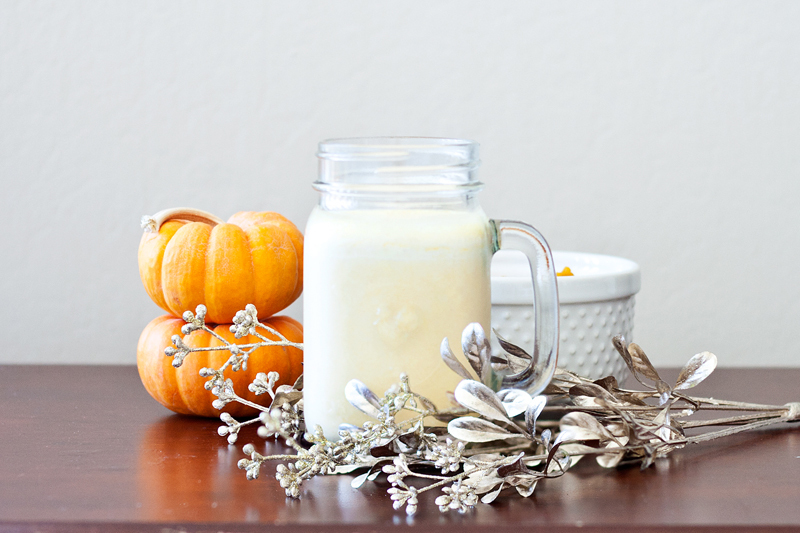 This pumpkin vanilla shake recipe is so easy and so delicious, you might forget about pumpkin spice latte! Well, at least on days when you don't want any caffeine! 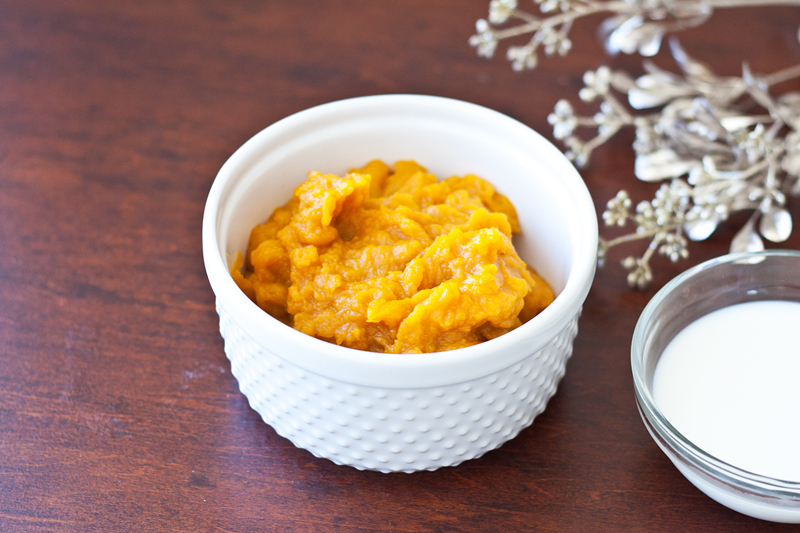 Just blend everything in a blender, top it with whipped cream (optional), and sprinkle a pinch of cinnamon on top. Yup, that's it! I told you it was easy! My holiday officially starts today! No more snoozing the alarm in the morning, no more commuting in the rain, no more working... for a couple of weeks! Yay! 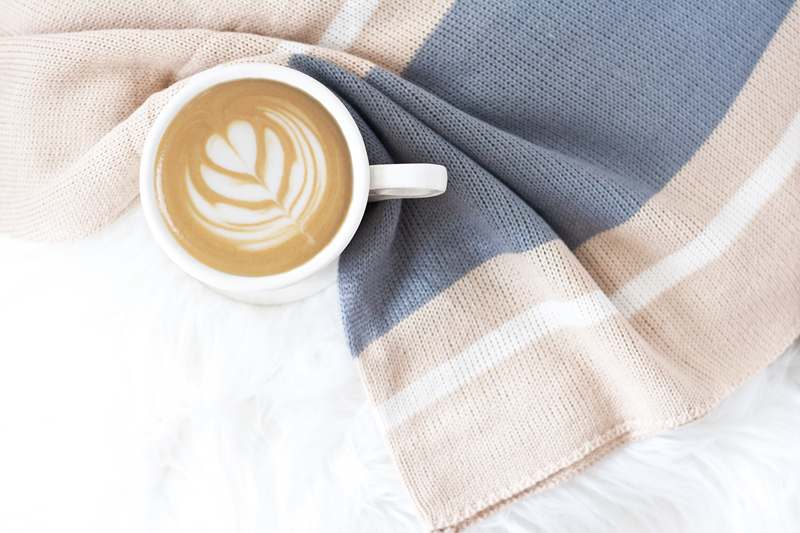 My holiday outfits this year have been falling on the more casual side, I have been opting for oversized sweaters and just really laid back styles. 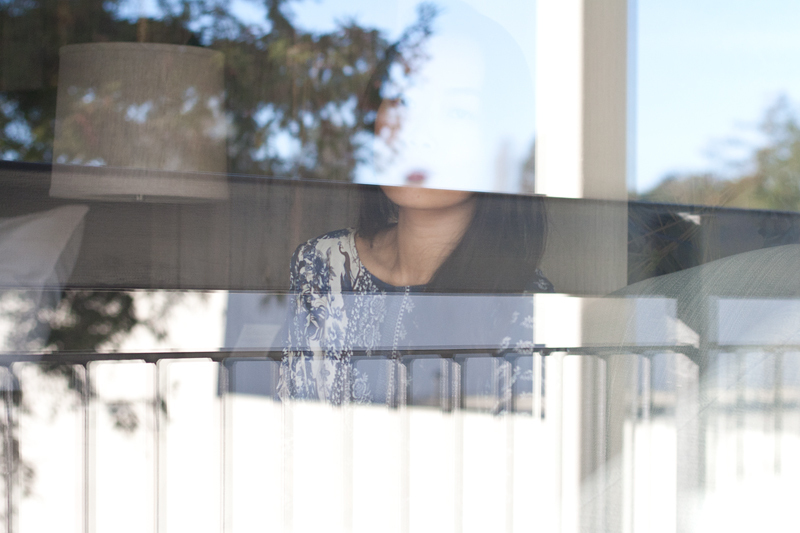 I guess ever since going back to the 9 to 5 world, I care more about feeling comfortable. 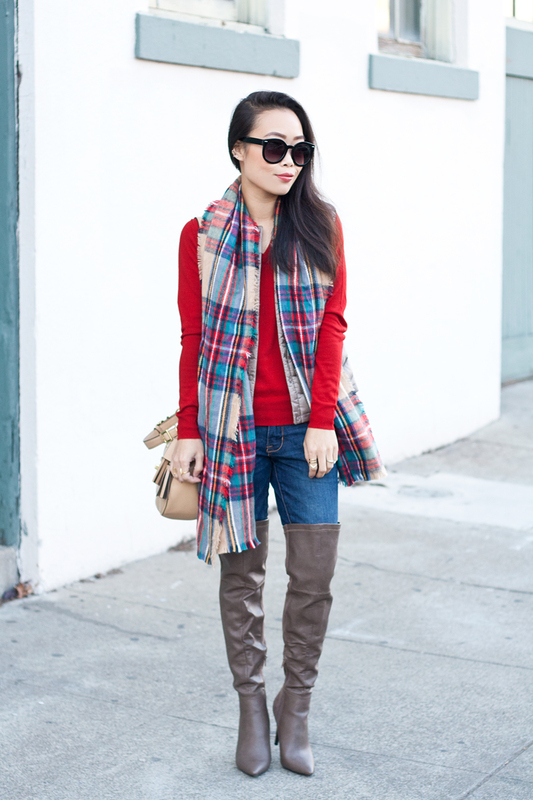 I rather bundle up in easy knits than having to pull and tuck a fancy blouse every two seconds! I have been living in this cashmere sweater by Madewell lately... so soft, so cozy, I love the pockets and the longline silhouette. 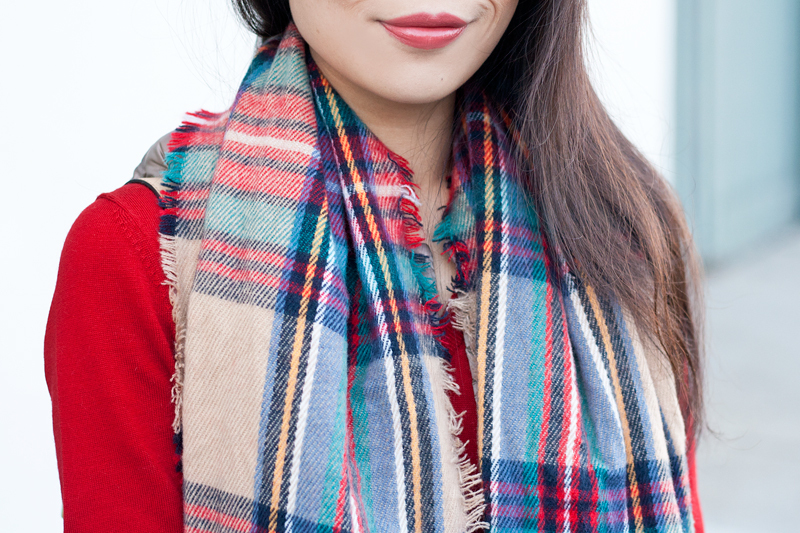 I pair it with literally everything but here I am wearing it with leggings, over the knee boots, a fun pom-pom knit scarf (took me forever to tie it into this awesome knot/bow), and this beautiful Etienne Aigner spotted leather and calfhair bag. 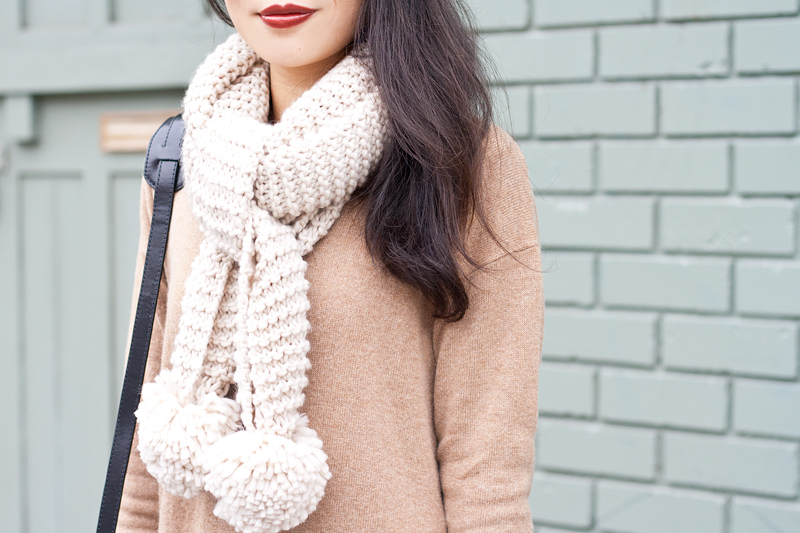 Pom-pom knit scarf c/o Charlotte Russe. Stag bag in dalmatian leather and calfhair c/o Etienne Aigner. 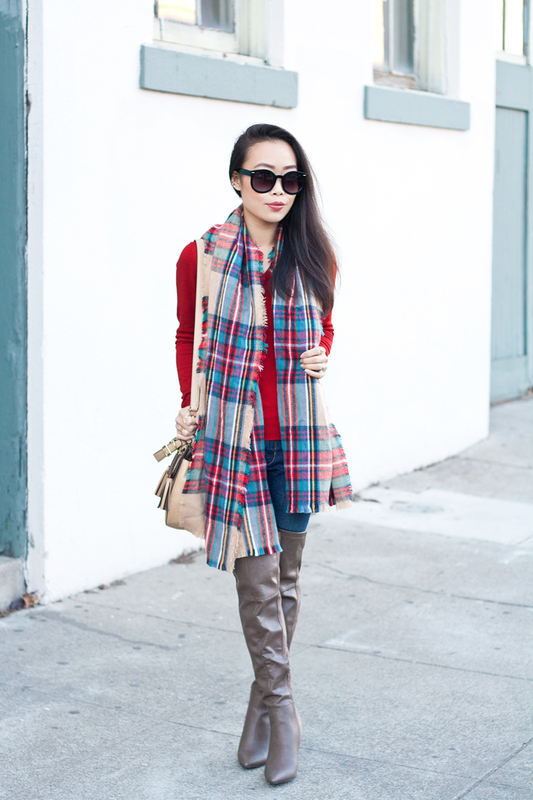 Over the knee boots from GoJane. 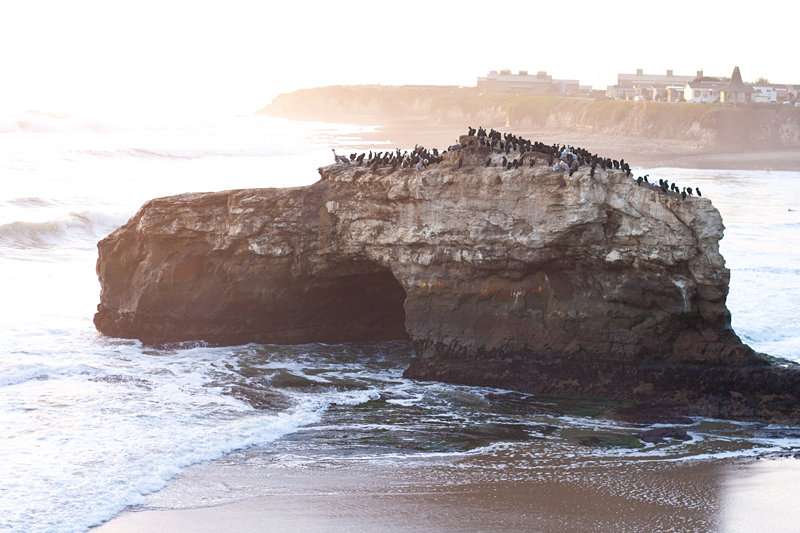 We had a little staycation last weekend in Santa Cruz. It's always good to be back in this little coastal town where we once called home for 5 years. 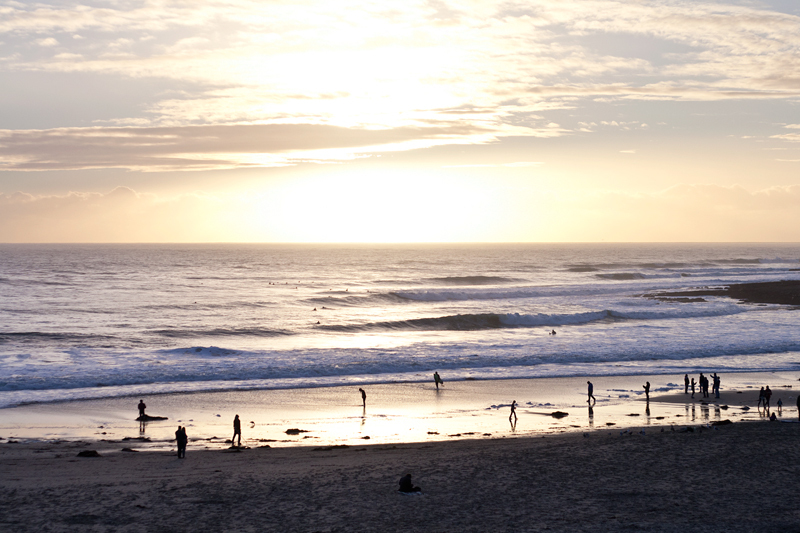 Santa Cruz doesn't exactly have the best eateries in the San Francisco Bay Area but we definitely miss some of the joints we used to frequent. This trip ended up being a food tour where we hit up all our old favorites, such as... Walnut Cafe, Rocky's, Aptos St. BBQ, Penny Ice Creamery, etc. Besides eating up a storm, we enjoyed walks along the coast and spent most of our time relaxing at Hotel Paradox which kindly hosted our stay. 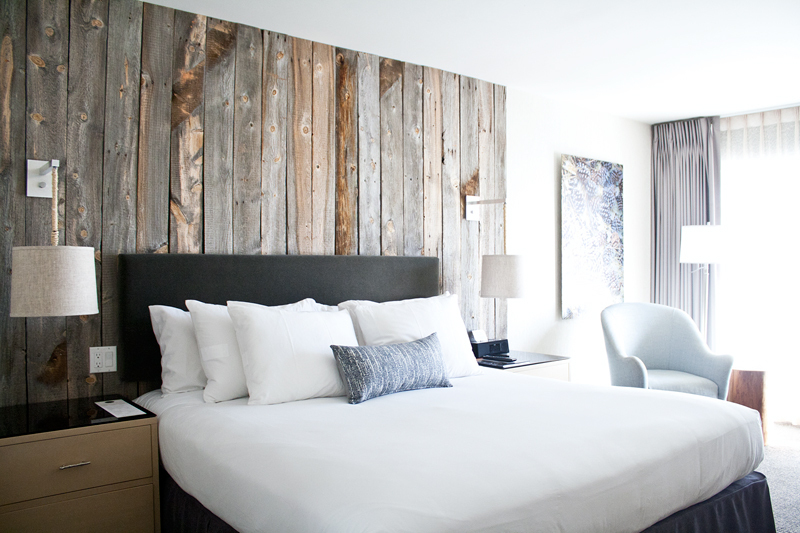 You know I love a good rustic and modern combo and Hotel Paradox is exactly that. 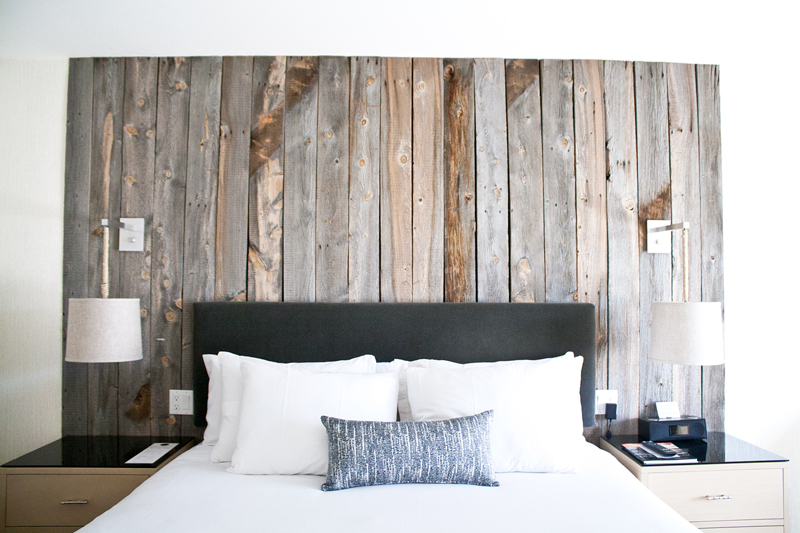 Just look at that amazing wood paneled wall behind the bed! 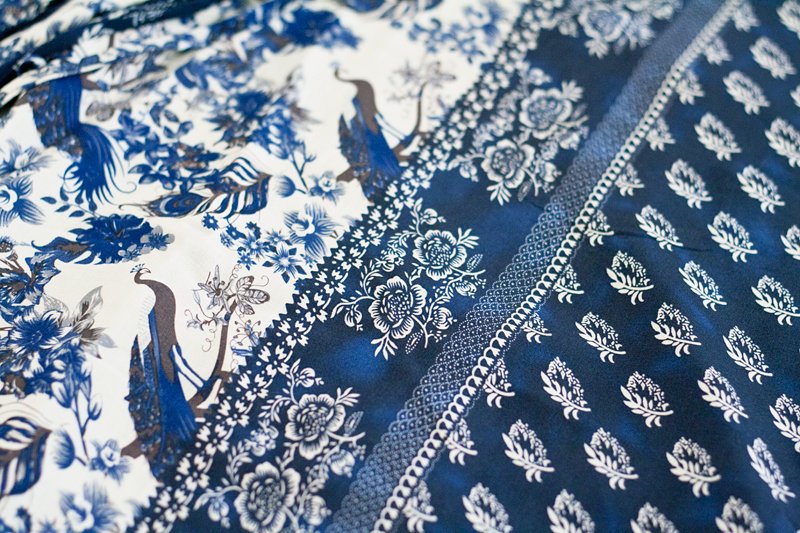 Mixed print fringe dress c/o Sea Gypsies. 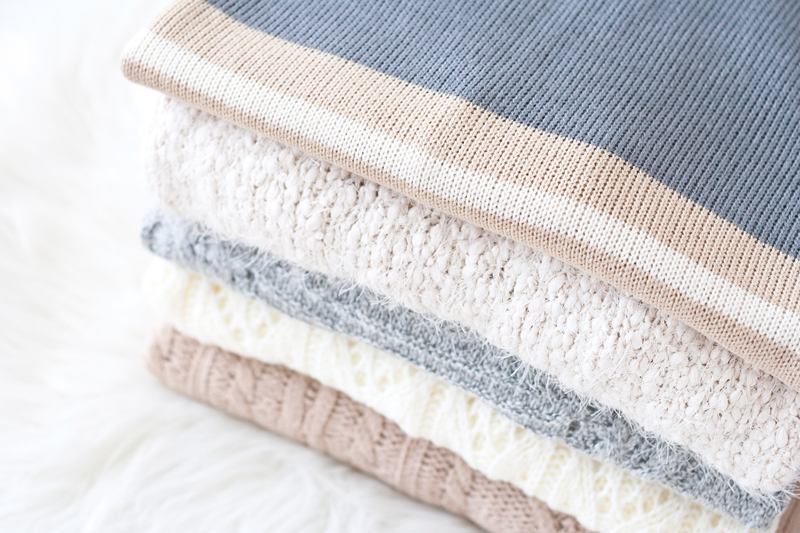 Sweater weather is in full force, time to bundle up in the coziest knits! 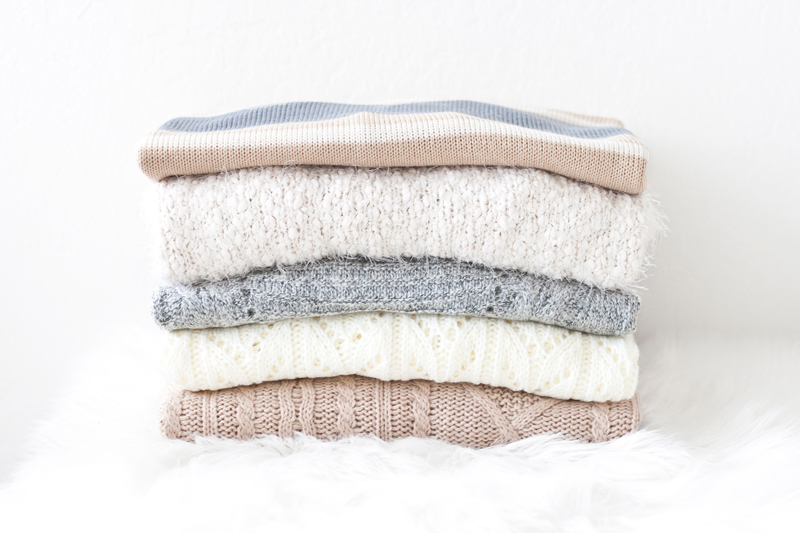 Although the holiday season might be all about rich vibrant hues (think red, burgundy, mustard, and deep forest green), I still gravitate toward neutral and pastel when it comes to shopping for sweaters. 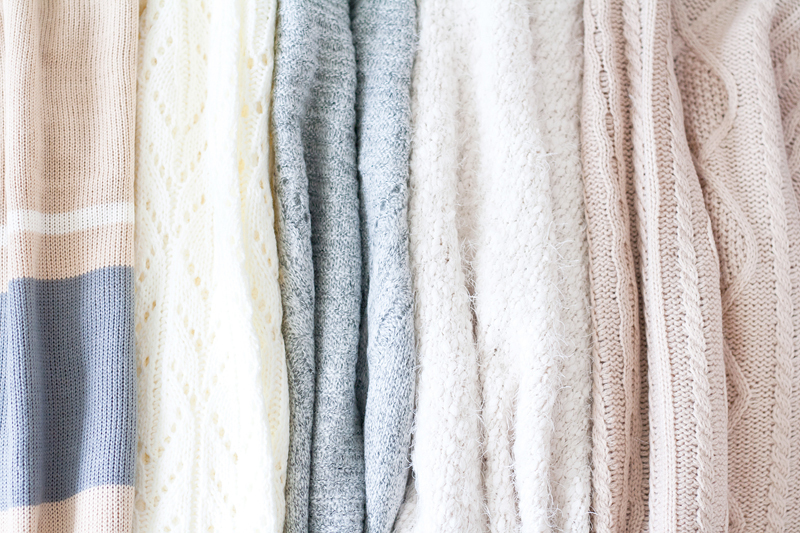 Look at it this way, these softer shades will carry you through the holidays and last you all year around. 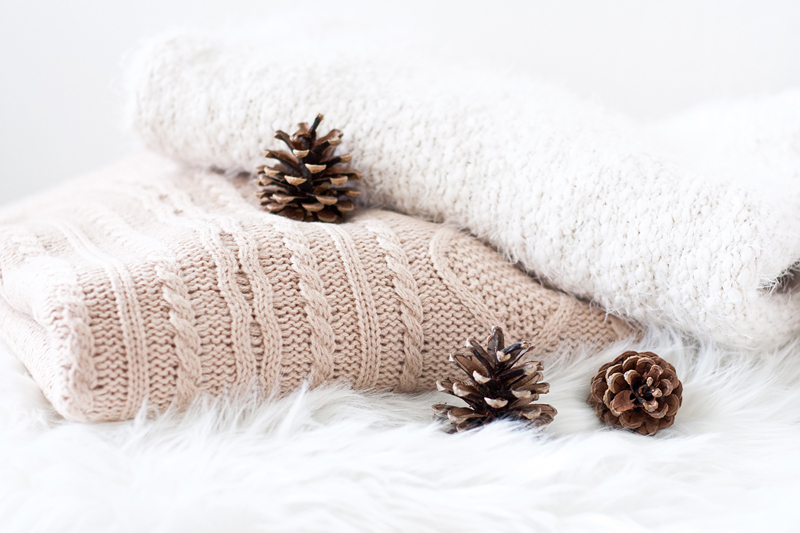 So, next time you reach for that red sweater with gold sequins, opt for the cream one instead! 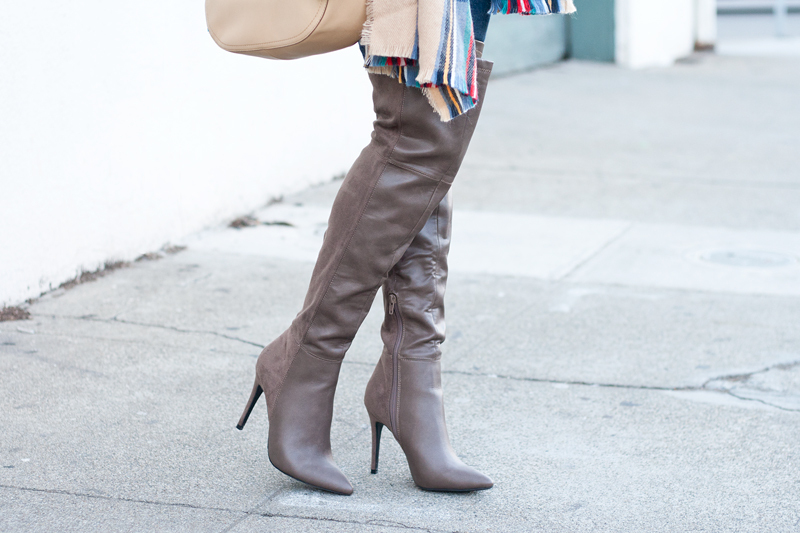 Colorblock knit poncho c/o Charlotte Russe. Off white pointelle sweater c/o Charlotte Russe. Gray oversized sweater c/o Charlotte Russe. White open front fuzzy sweater c/o Charlotte Russe. 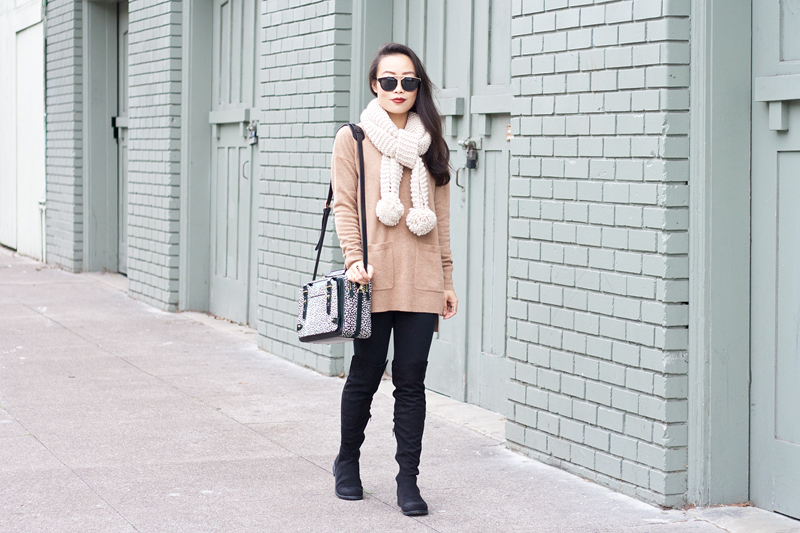 Blush mock neck cable knit sweater c/o Charlotte Russe. It's that time of the year where it is perfectly fine to dress like a present. 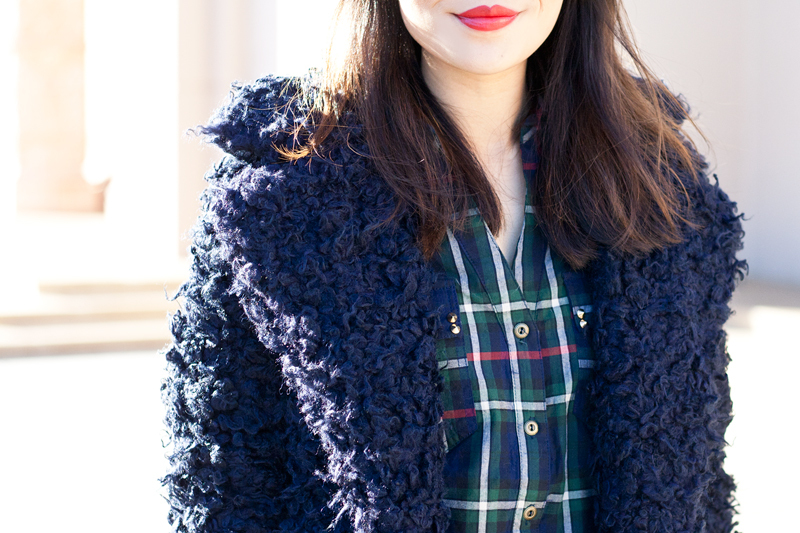 Whether you are rocking an oversized bow or wearing so many colors that you look like a Christmas tree, it is A-OK! I am currently having a bad case of holiday-ritis, 5 more days of work and I get 10 days off. I love my job but I love vacation even more! 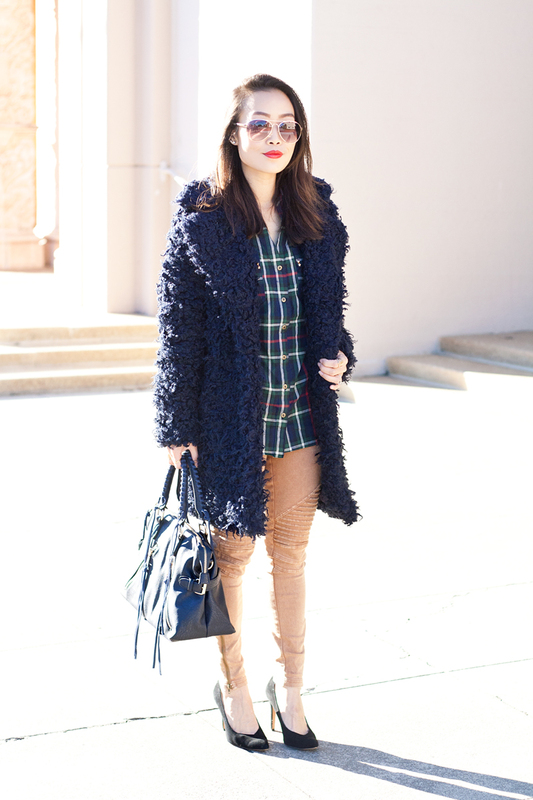 In the meanwhile I am just going to dress for the holidays... much like this look here. 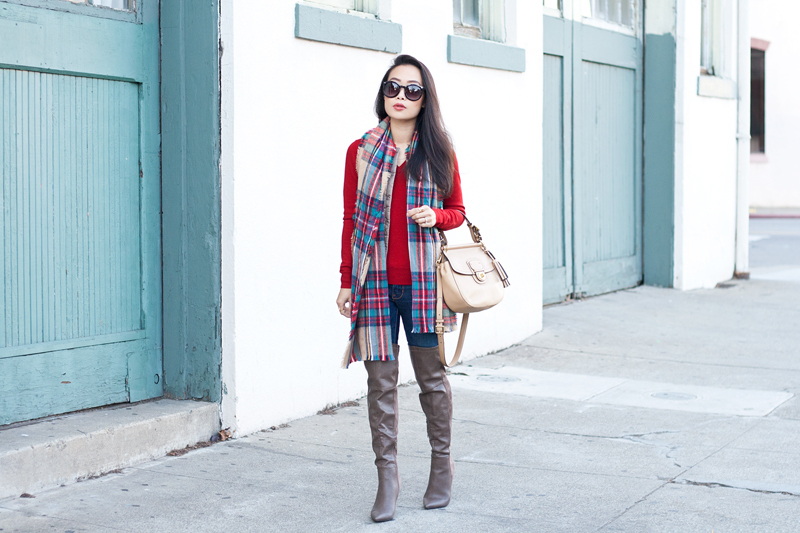 I am wearing a red merino sweater and an ultra light down compact vest from Uniqlo, denim from Old Navy, paired with a plaid scarf in the most gorgeous color combo, one of my all time favorite Coach bag, and these over-the-knee boots that I can't stop wearing! 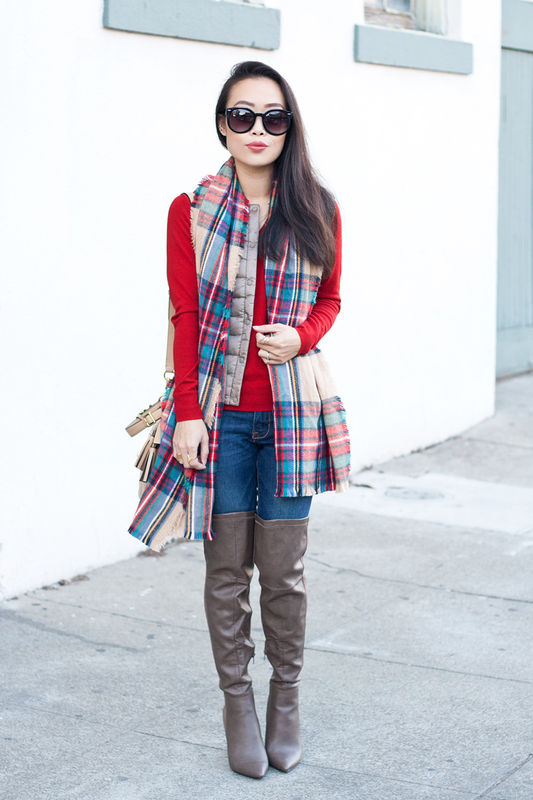 How do you dress for the holidays? 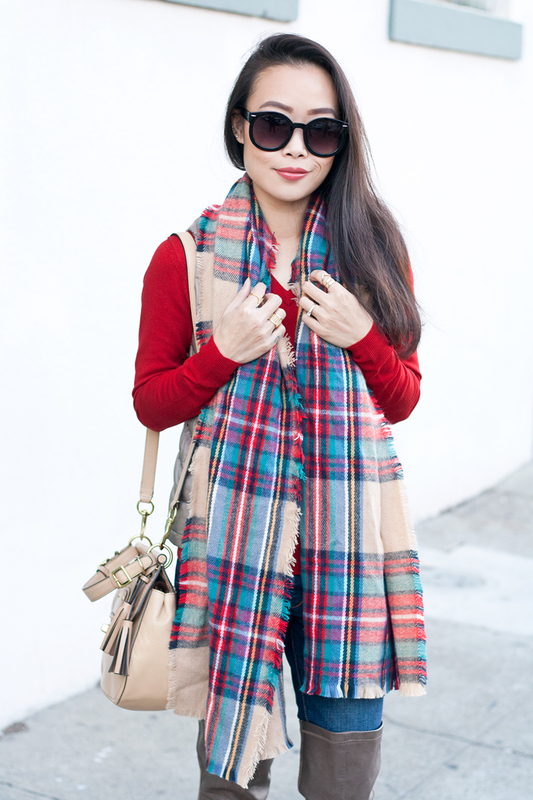 Merino sweater in red c/o Uniqlo. 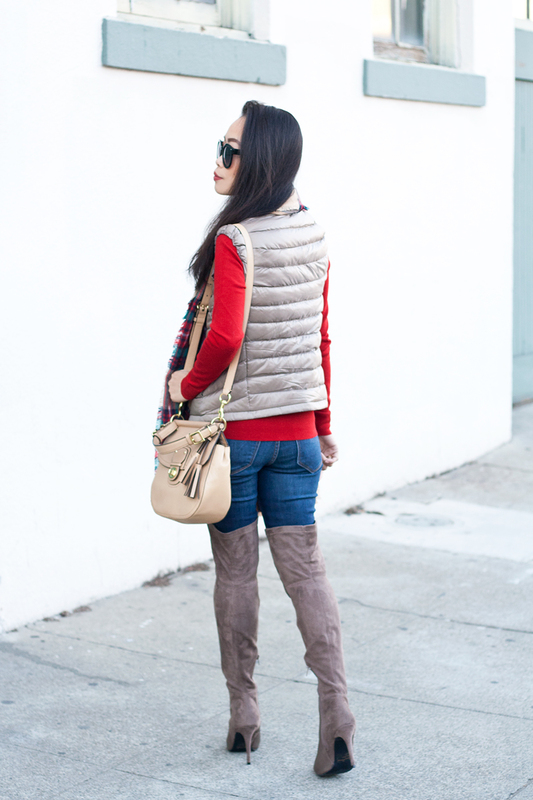 Ultra light down compact vest in beige c/o Uniqlo. Skinny jeans from Old Navy. 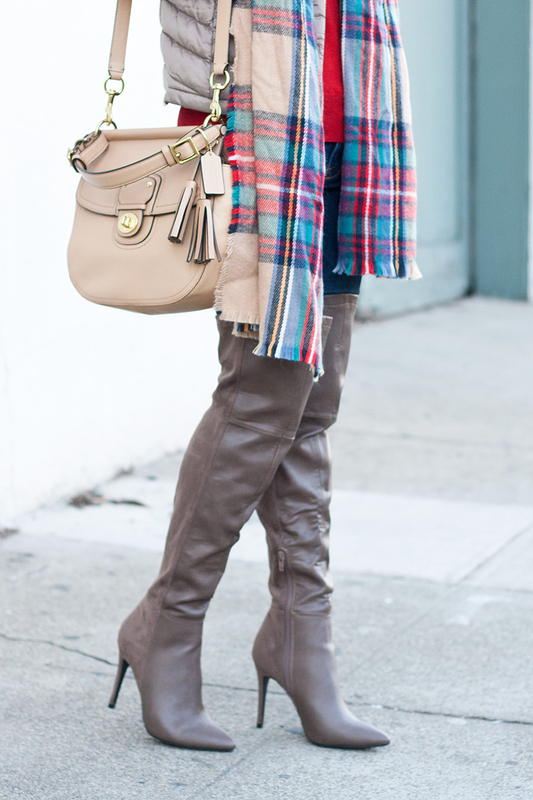 Over-the-knee boots c/o Charlotte Russe.